Bhubaneswar: Mr. Tomasz Kozlowski, Ambassador of European Union to India & Bhutan visited Kalinga Institute of Social Sciences (KISS) on September 24, 2018. “It is so nice to see your smiling face here. 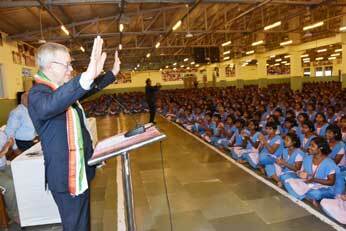 You are the real hero,” he said in his address to the students. Emphasizing on girls’ education and child right, he said, education is the only way not only to eradicate poverty, but also to solve the problems of Child Right and women empowerment. “Through education you can create your bright future and empower your community as well. I will stay hours with you in my next visit to Odisha”, said Mr. Tomasz. He thanked Dr. Achyuta Samanta, Founder, KIIT & KISS for his continuous efforts to bring empowerment through KISS. He assured students all possible support to KISS. Among others, Shri R. N. Dash, Secretary, KIIT & KISS; Prof. Harekrushna Satapathy, VC, KISS Deemed to be University; Dr. P. K. Routray, CEO, KISS; and Julius Lakra, Registrar also spoke on the occasion.